A fire within the heart of the Facility in 2010 destroyed the main lager brewery plant on site. The aftermath of the very severe fire left a highly dangerous, contaminated site mainly comprising of reinforced concrete, substantial steel carcassing, plant & asbestos waste on a large scale. The wreckage was deconstructed in a very sensitive and controlled environment under the most vigorous supervision, incident free double shift program. 18 No Large Vessels were inspected and reviewed for structural integrity, Secondary Lift Mechanisms were designed and installed in house for each of the tanks to be lifted out over a 14 night program. The remainder of the plant consisted of large Plant room, pump valves and pipe runs which were de-installed by hand and removed off site. Adjacent office space and logistics area were also removed. All of the above works were completed within a circuit of Live Pipe Corridors, bridges holding the main utility services feeding the entire plant processes. To work safely alongside these, specially designed Crash Deck support systems were installed over live pipe racks to allow works to proceed safely and avoid any interruption to the Plant. The Existing Garage where Diageo performed all internal Plant Maintenance was demolished to facilitate the overall re-development of the Plant. The Garage was a substantial building of brick and reinforced concrete along with a very heavy structural steel framework; roof trusses serving long spans to incorporate service lifts, internal plant installation. Roof covering was listed as an Asbestos Roof Clad “ Galbestos” of which was removed under strict conditions and guidelines in accordance with the H&S Legislation. The Building was carefully demolished within the surrounding live Keg Loading Yard service over 30 Diageo Vehicles at any one time without incident and within program. A total of 4,500 Tonnes of Salvaged steels was removed from the facility over a 2 year program. We are doing all necessary excavation and blinding preparation work for foundation pads and ground beams in Project Phoenix. This work also involves Temporary Groundwork Support for deep excavations at a Grain Intake Pit and Attenuation Tank. These both required driving Trench Sheets and installing Structural Steel supports. Further works also included the installation of new Drainage schemes including Petrol Interceptors and Upflow Chambers and electrical ducts to service the entire Project. Utilities works packages also included the sub- structural works around and within a live refrigeration & fermentation plant which detailed a substantial Temporary Works plan which was incorporated in order to carry out the works. 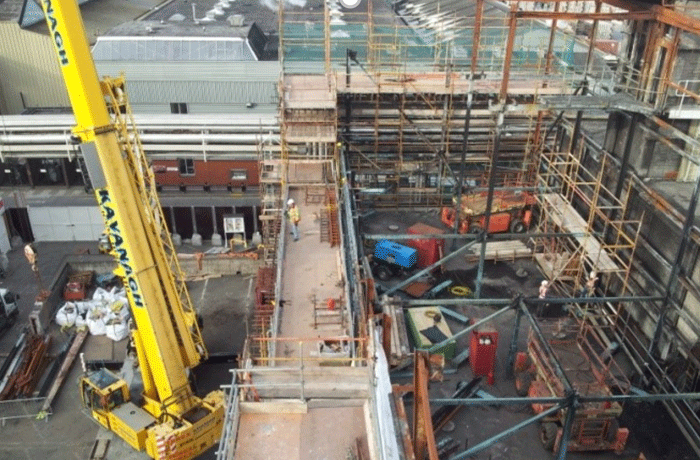 Hegarty Demolition were also engaged to dismantle sections of the existing Pipe rack which had become obsolete as a result of the new Structures. This had to be carried out with absolute caution as the pipes are intrinsic to the production of the Brewery and was achieved without incident.